Story and Recipe By Nicole Taylor of Food Culturist and author of The Up South Cookbook. Punch bowls remind me of togetherness. The gorgeous etched vessels are a symbol of unity. When I feel like having “church” or gathering folks, I pull out my mid-century centerpiece (a gift from Dr. Jessica B. Harris, author of A Kwanzaa Keepsake) and celebrate. On the first day of Kwanzaa, I’ll be toasting boundless named and unnamed culinary creatives. Umoja — To strive for and maintain unity in the family, community, nation and race. Let us uplift our brothers and sisters–all over the diaspora. Let us build on the foundation and roadmap laid out by our ancestors. Let us remember our greatness in every endeavor. Cut the top and bottom of pineapple. Next, sit the fruit upright and cut down the sides. Flip the pineapple on its side cut in half. (It’s ok to use canned pineapples. If so, please purchase sliced variety in 100% juice and reserve liquid). Cut into ½-inch round slices. Sprinkle pineapple slices with salt, ginger, and brown sugar. Place slices on parchment paper or silpat (nonstick baking mat) on baking sheet or jelly roll pan. Roast for 25 minutes. Transfer pineapple slices to Vitamix or food processor, pulse until liquid is loose and foamy. The fragrance will be bright. Set aside. Place water in a large stockpot, over medium-high heat. After coming to a boiling, drop in hibiscus leaves. Most specialty market or online stores will carry hibiscus (I don’t recommend hibiscus tea as a substitution here). Cover and let brew for 10 minutes. Stir in sugar and turn off heat. Let completely cool. Remove leaves. Add lime juice, pineapple juice, rum, and ginger beer. Stir well. Transfer to punch bowl. Place scoops of lime sorbet in punch bowl, if desired. The mixture will slightly foam. The sorbet will make the punch a tad sweeter. Recipe reprinted with permission from The Up South Cookbook: Chasing Dixie in a Brooklyn Kitchen by Nicole A. Taylor, The Countryman Press, 2015. 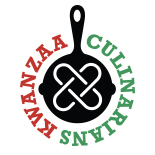 This entry was posted on December 26, 2015 by Kwanzaa Culinarians in 2015, Recipe, Umoja and tagged drinks, Food Culturist, New Age Church Punch, Nicole Taylor, Punch, rum, The Up South Cookbook, Umoja.